Like a lot of suburban homeowners, Scott and Paula Moore have just completed a renovation on their home. Construction is never easy, but what they’ve done is unique and beautiful — a perfect fit with their lifestyle. It’s not a new kitchen with fancy granite countertops. Nor is it a custom bathroom with a dozen showerheads. The Moores have reconfigured their basement with a brand new stage, great acoustics and seating for 60. And they’d love for you to come by and check it out. Melanie is a typical teen who likes the All American Rejects and Panic at the Disco. She also favors less well-known bands – the bands who come to the family home to perform. Tonight, though, she’s downstairs even before the music begins. Upstairs, her dad is helping guests with reservations check in, collecting the ‘‘artists’ donations” and selling CDs and T-shirts. Later, when he’s introducing tonight’s performers, he’ll refer to his dining room as ‘‘the CD boutique” and he’ll only be halfway joking. The Moores are not musicians, or businesspeople, or managers or agents. They don’t get a cut of the profits — not a cent — and they don’t seem any more extroverted or gregarious than most folks do. They’re just music lovers, folk fans and acoustic enthusiasts. And so are the dozens of friends, neighbors and total strangers they welcome into their home every month. Not really. Kagan is Executive Director of the Carl M. Freeman Foundation, a former member of the Maryland House of Delegates, a lifelong Montgomery County resident and a deeply committed fan of folk music. She’s so deeply committed that four times a year, she and her husband David Spitzer open their living room, dining room, kitchen, den, guest rooms and finished basement rec room to the performers they love — and scores and scores of audience members culled from a database of more than 1,000. The lady walks the talk, too: Kagan and Spitzer, a physics teacher at Blake High School in Silver Spring, actually met at Scott and Paula Moore’s house. ‘‘It was June of ’99,” says Kagan, who remembers that Diana Jones opened for the folk duo Barton & Sweeney in the basement that night. Soon after, when a nearby house concert venue fell through, the couple suggested holding the show at their place. At their latest show, 73 guests showed up, bearing potluck goodies, buying CDs and T-shirts, and observing the no-red-wine rule for the sake of floors and furniture. Kagan is a political animal, and her concerts tend toward the political, too. 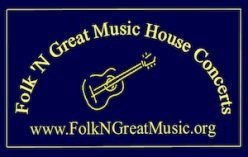 ‘‘We are the very first house concert in the country to become a Fair Folk venue,” she says, meaning that Folkin’ Great hires acts that belong to Musicians Local 100 and supports endeavors like the Naked Folk Calendar, a fundraiser that helps supplement the cost of health insurance for musicians. Still, it’s a thoroughly modern affair. ‘‘People think of folk music and they have flashbacks from the 1960s,” says Kagan, who didn’t hit double digits until the ’70s. ‘‘They’re not aware that it’s entertaining, fun and inspiring. Cindy Broome is a D.C. copy editor who lives in Alexandria, but she’s happy to travel to Montgomery County for a house concert. Broome happens to be president – along with vice president and chairman Scott Moore — of Focus (www.focusmusic.org), a musical nonprofit that presents three concerts monthly. But, she says, nobody gets territorial about shows or performers. Indeed, Joel Pomerantz, a member of the board of the Songwriters Association of Washington, (www.saw.org) calls himself ‘‘sort of a ubiquitous presence. Whatever the genre, house concerts tend to be smoke-free environments: ‘‘A huge plus,” as Broome says. They also tend to feature performers that folk fans want to see. That’s what Cheryl Kagan says. Kagan says performers come by invitation only; she and Spitzer, like most house music hosts, spend considerable time at folk festivals, like Falcon Ridge in New York and the Memphis Folk Alliance, looking for fresh talent. That’s what audiences count on; at the Mooreshouse, (www.mooremusic.org) some fans have come from as far away as North Carolina to see the band, which on this particular night happens to be Red Molly. Some are neighbors; some are regulars. Everyone is acknowledged and made to feel at home. A scattering of hands go up. There are veterans here, too. Some remember the very first Moore Music house concert nearly 10 years ago. Red Molly is a roots Americana trio, pretty performers who could give the Dixie Chicks a run for their money with their soaring train-whistle harmonies, bluesy guitar licks and smart in-between-song banter. ‘‘So many dead people — it must be a folk song,” sighs Laurie MacAllister. They sing about coal miners and bein’ done wrong and the long ride home, and it’s hard not to think about Hank Williams and Patsy Cline and Emmylou Harris — until they break into a riff from ‘‘Cat Scratch Fever.” Before you know it, you’re thinking about REM and Mark Knopfler and Patty Griffiths, too — and mostly Red Molly. They’re really, really good. For awhile, this could have been a party on a Saturday night at anyone’s house, but now the sounds of guitars, banjos and mandolins fill the air and it can only be, well, a house concert. A nice addition to any home.